﻿ Cristiano Ronaldo: "We will win against Barcelona this year"
04.10.2011 » Cristiano Ronaldo: "We will win against Barcelona this year"
Cristiano Ronaldo visited the "Centro Navas de Tolosa" last Thursday, a centre for disabled children and felt the need to spread his confidence among the audience. Ronaldo told everyone to be calm, because Real Madrid will beat Barcelona this year. Cristiano Ronaldo showed his solidarity side once more, when he made a surprise visit to "Centro Navas de Tolosa", a centre for disabled children. One of the remarkable moments of this visit took place when a youngster approached Ronaldo, not only to tell him he is better than Lionel Messi, but also to question him if Real Madrid is going to win against Barcelona this year. Cristiano Ronaldo's answer was predictable as he affirmed that Real Madrid will beat Barcelona this season. When the young kid came near Cristiano Ronaldo, everyone felt that an interesting moment would come out from there. The kid's name is Amador, and his words towards CR7 were the following: "Hey Ronaldo, you are the number one, you're better than Messi. But please answer me: Will we win against Barça this year?". Cristiano Ronaldo showed his complicity through his smile and while he put his left arm over the kid's shoulder he replied: "You can be calm, my friend. This year, we will win against Barcelona!" That moment somehow triggered even more the young Amador, as well as his fellow friends from the centre, who were also receiving Cristiano Ronaldo in the school facilities. Amador turned to more than 50 of his friends who were near him and still visibly excited with Cristiano Ronaldo's presence and statement, he shouted: "Let's now sing Real Madrid's hymn!". The room suddendly got immersed by all the happyness in those childrens faces, as they loudly chanted Real Madrid hymn. Cristiano Ronaldo decided to go with the moment and joined the tune, as he also felt impressed with the kids commitment and dedication. A special moment that will certainly remain in those kids memories throughout their lives. Jorge Mendes, Cristiano Ronaldo's agent, was also visiting this disabled children centre, side by side with CR7 and he also confessed he got surprised with everything that was happening: "It has been a while since I have seen Cristiano Ronaldo so touched like this. He is also a big kid and he gets moved in moments like this." 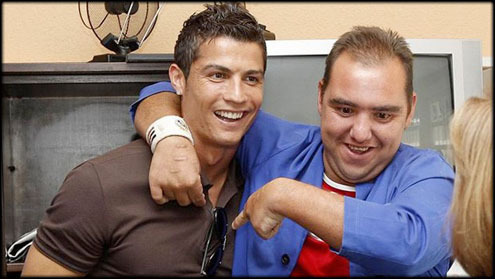 Another person who was granted the chance to follow this surprise visit from Cristiano Ronaldo to "Navas de Tolosa" centre, was Dioni (Dionisio Martín), a Real Madrid fan, a member from a popular music group in Spain, called Camela. Dioni: "This is the same neighborhood where Raúl (Real Madrid former player) grew up, but until he manages to pay us a visit in the future, it's a tremendous honor that we had the chance to receive the best football player in the World! Cristiano Ronaldo will be forever in our hearts." Cristiano Ronaldo showed up on this surprise visit last Thursday, but this has only been reported today, almost a week after. The reason for this appearance to be kept as a surprise was to avoid that all the kids and older members of this disabled centre to get over-excited with the event. From what we could gather in several reports from the Spanish press, Cristiano Ronaldo was received absolute perplexity and astonishment and several funny statements could be collected among the school members. "My god, it's Cristiano Ronaldo! "; "Cristiano, I'm an Atlético Madrid fan, but you are the best...", were just a few example of quotes from that day. Cristiano Ronaldo got very touched with the events that were taking place and was visibly moved by all hard-working spirit and belief shown in the children and grown-up members from the centre. Ronaldo: "Jorge (his agent), this is very hard, but these people are incredible. They deserve everything that can be done for them. ", allegedly said CR7, according to As.com sources. The director from "Navas de Tolosa" centre for disabled children, guided Cristiano Ronaldo in this visit, showing him the gymn, the sensory stimulation room and the computers "office". In a visit that lasted around 45 minutes, Ronaldo had the opportunity to leave behind all that pressure and typical frenzy from the media, to show his solidarity side in such a "charity" initiave. Ronaldo will certainly leave those kids and grown-ups, with a life-time memory that will forever make them smile and have hope in their future, when they remember the day Cristiano Ronaldo visited them. Hats off, Ronaldo! Cristiano Ronaldo will now join the Portuguese National Team and start preparing the games against Iceland and Denmark. You can watch Juventus live stream, Portugal vs Iceland live streams, in our Football Live Streams section. The countdown clock timer, displaying the time left for the next CR7 game, is shown on the top right corner of all pages. This weekend, you may also watc Montenegro vs England live streams and Czech Republic vs Spain live, both streamings provided from our "Live" section.